Fig. 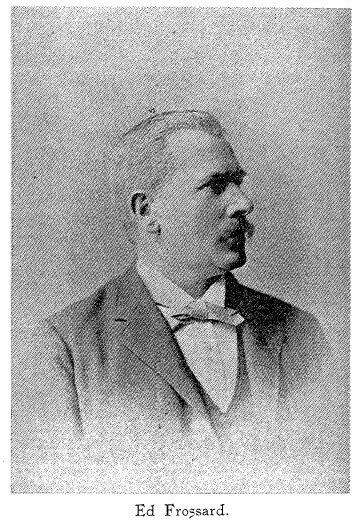 Photograph of Edouard Frossard published in the March 1892 issue of The Numismatist. Frossard, Édouard (1837/8-1899), 53 Prospect Place, NY. 787-789 Broadway, NYC, NY. Irivington-on-the-Hudson. time was Richard Despard Dodge, who became a prominent businessman in New Jersey and New York. for which he had decided taste and returned to New York State, where he has since resided.”--The Numismatist, March, 1892, page 32. Christian Association (YMCA) in Brooklyn, New York. issued in the 2d year of the Republic, 1793, Series 3520, one of the later series banknotes, signed by one of the unknown signatories Saussay. Revolution. It was declared the state motto of Virginia in 1776. Below is the French quote "Tous les hommes sont egaux devant la loi"
Fanning Fixed Price Catalogue February 2017, item No. 12, $250. Courtesy Lupia Numismatic Library. The Red Skull and Crossbones found on Frossard's card were formed into a die and was a stock item among American 19th century printers. This label above of druggist R. C. Mathewson, Boonville, Indiana dates to 1867, and serves as a good example to demonstrate this point. In 1872 he began collecting Large Cents for himself and George W. Merritt, the son of the wealthy owner of the palace at Irvington, New York. In 1875 he became the editor of the Scott & Co. publication Coin Collector Journal, a position he held from December 1875-December 1877. 1877 and 1892 he conducted over 100 coin auction sales and compiled catalogues for W. E. Woodward, Bangs & Co., H. G. Sampson, and others. He cataloged the Montayne collection of 1,200 lots for H. G. Sampson in the course of only forty-eight hours. long-time associates and patrons Merritt and Parmelee. 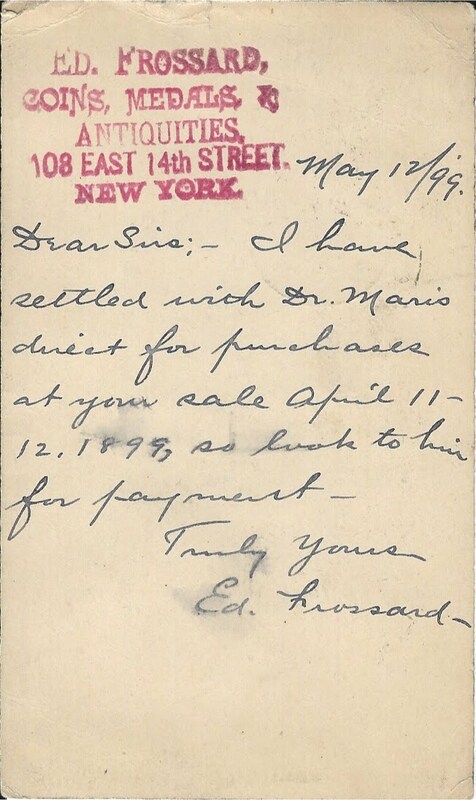 Frossard and William Elliot Woodward did not get along and feuding between these two mammoth dealers was fierce from 1880 to 1881.
forming the finest collection in the country. South Creek, North Carolina. Courtesy Lupia Numismatic Library. On December 22, 1891 he held his 109th coin sale, the F. B. Bennell collection. question : “Brother Tatman to please make our friend Frossard, Counterfeit Detector, instead of Counterfeit Director. 1910. His collection of 1794 cents was sold in his auction of October 2-3, 1884.
withdrawn prior to the sale as an altered date. John Trumball, the famous American artist and painter. He claimed to have bought them from a gentleman of Virginia who inherited them. Frossard was offering them for sale for $8,000.00. On Friday, January 24, 1896 he auctioned the collection of E. B. Crane of Worcester, Massachusetts, 530 lots. His collection was cataloged in 37 pages contained 416 lots and auctioned off by the American Art Association, March 19, 1896.
and far more precious than the business card. Special Collection, The Chapman Family Correspondence Archive. Steigerwalt he commented how Frossard's death was sudden and unexpected. The funeral service took place at his home on Thursday, April 14th. He is buried in the White Plains Rural Cemetery, White Plains, NY. He was a member of the Solomon’s Masonic Lodge No. 196 of Tarrytown; U. S. Grant Post, G.A.R., the ANS, and charter member of the ANA. and owed many dealers hundreds of dollars totaling in the thousands.